With the flowing dialogue, open air set design and a marvelous cast, Jane Austen is well represented on stage at the Repertory Theatre of St. Louis with an absolutely captivating production of her “Sense and Sensibility.” She has gotten a lot of mileage out of a handful of novels and none more charming or genteel than this one. We are introduced to two sisters, Marianne and Elinor, who recently lost their father and now they and their mother are forced out of their home and take up residence in a small cottage. As men- both noble and humble, witty and dull- pass through their lives, decisions are made and circumstances intervene to make those lives the stuff of drama and romance. We spend a couple of pleasant hours with them representing many years until this valentine (appropriately for this month) of a show is wrapped up with ribbons of sentimentality and smiles. 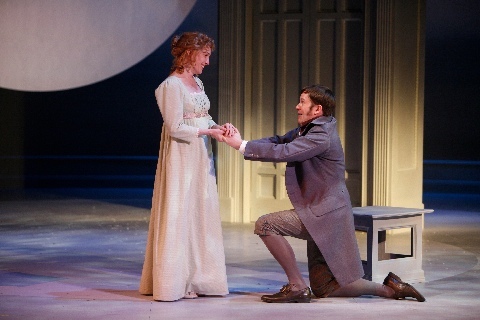 Adapted and directed by Jon Jory, “Sense and Sensibility” is one of the most successful transformations of Jane Austen to the stage we’ve seen. Combined with the airy feel of the Tom Burch set design that tosses away the limiting conventions of English mansions and the uptight stuffiness they bring, it gives a certain joyful and even playful feeling to the proceedings. The rest of the design team- Patricia McGourty’s costumes, Ann G. Wrightson’s lights and the appropriate soundtrack of Joe Cerqua add to the sprightly surroundings. Amelia McClain is a fanciful Marianne as she hopes for true romance while her more sensible sister, Elinor, is given a wonderful turn in the hands of Nancy Lemenager. Their mother, Mrs. Henry Dashwood, is played to the hilt by a delightful Penny Slusher. The often dastardly side of the family who forces them to vacate their home are beautifully portrayed by local favorites, Kari Ely and her real-life hubby, Peter Mayer. Geoff Rice is perfect as the enigmatic Edward while Alex Podulke shines as the stiff-as-a-rail Colonel Brandon. Charles Andrew Callaghan is a treat as the flamboyant- if scheming- Willoughby and Diane Mair is equally cunning as Lucy Steele who throws a monkey-wrench into the hopes of marriage for one of the sisters. V Craig Heidenreich is properly brash as the boastful Sir John and Nicole Orth-Pallavicini is sweet as Mrs. Jennings. 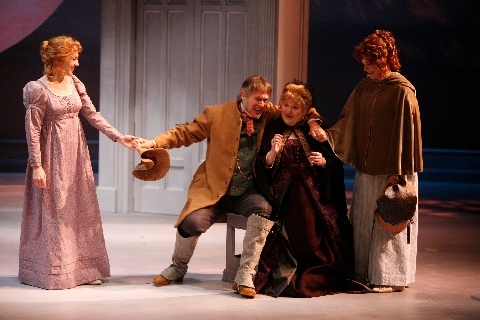 Another local favorite, Michelle Hand, gets her first moment on the Rep stage and makes the most of it as both Lady Middleton and Mrs. Ferrars while Jonathan Finnegan plays a few roles including the country-bumpkin brother of Edward. Director Jory has done wonders with the cast of servants, other nobles and assorted country folk as they provide the lighting-fast set changes on this wonderful, romantic set. From mansions to gardens to cottages and back again as actors stroll into their next scene in the blink of an eye as the open air set transforms to their next destination. It’s not an easy feat to make these set changes seem effortless and not break the continuity of the script. A big shout out to these wonderful performers as well. Much like Shakespeare’s “A Midsummer Night’s Dream,” this production of “Sense and Sensibility” transfers you to a state of mind rather than any physical location. The great Jane Austen story remains strong, but you have an ethereal feeling throughout the play rather than the stodgy sense that you’re in Victorian England. What a marvelous production. One personal note: since I had been laid up with the flu bug and missed opening night, I attended a Wednesday matinee and what a different audience I encountered. Busloads of senior citizens (of which I am a proud member) filled the crowd and as soon as the final lights were dimmed and the actors poured onto stage for their curtain call, seniors jumped to their feet. Unfortunately, it wasn’t a standing ovation but rather a cattle call like egress to get to their buses (I guess for the best window seats). Haven’t seen that since the Muny. Despite that minor setback (and a few more than usual coughs and candy unwrappings throughout the show itself) this was a most pleasant theatrical experience. 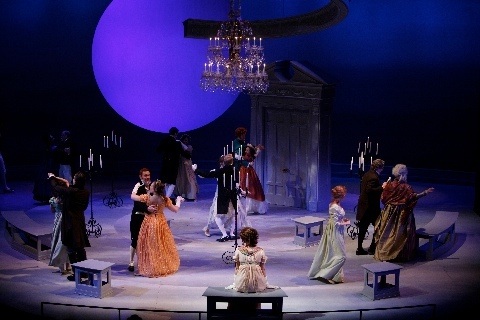 I urge you to see this delightful show, “Sense and Sensibility” before it all comes to and end on March 3rd. Call the box office at 314-968-4925 for tickets or more information. This entry was posted on February 16, 2013 at 9:43 am02 and is filed under Uncategorized. You can follow any responses to this entry through the RSS 2.0 feed. You can leave a response, or trackback from your own site.